These guidelines have been written to address issues relevant to Southern Africa. Countries in the region vary between middle income and low income countries, and therefore affordability has been taken into account. Only treatment and diagnostic options available in Southern Africa have been included. The unavailability of diagnostic or monitoring tests in poorly resourced settings, should not pose a barrier to providing ART to those in need. The viral load is the term used to describe the amount of HIV in a person's blood. Without HIV treatment the virus (HIV) makes copies of itself which cause the amount of virus in the body to increase. The CD4 cell count is the number of blood cells in a cubic millimetre of blood. The goals of ART are achieved by suppressing viral replication completely for as long as possible, by using well tolerated and sustainable treatment with good adherence by the patient. Good adherence by the patient means that the patient takes the ART exactly as they are supposed to, and does not have any times when they do not take the treatment. Patients who adhere well to ART have a near normal life expectancy. With prolonged viral suppression the CD4 count usually increases, or at least there is not a decline in CD4 count. This is accompanied by a restoration of immune function. The immune system is what protects a person against disease. For most patients their immune system being restored results in a dramatic reduction in HIV associated sickness and the chance of death. It is though still unclear whether the immune function ever returns to complete normality. There are currently five classes of ART drugs available in southern Africa. The most commonly used drugs inhibit one of three key HIV enzymes required by the virus for intracellular replication. If the table is too big for all the columns to be shown horizontally on your device, then scrolling horizontally should allow otherwise cut-off data to be seen. None of these drugs should be used without getting advice from a doctor. This list is only provided for general information. 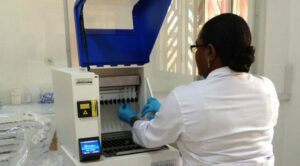 A number of two drug and three drug fixed dose combinations (FDCs) are available in southern Africa. These FDCs reduce the burden of multiple pills and may improve treatment adherence. Everyone who is diagnosed with HIV is now strongly advised to take ART. People are also advised to start ART as soon as possible. Delays to starting ART should be minimised. In particular people who have severe immunosupression (CD4 count < 200 cells/µL) are at significant risk of opportunistic infections (OIs) and associated mortality. They should be assessed rapidly and initiated on ART within one week, once adherence counselling has been started. An exception to this is if patients have cryptococcal meningitis (CM) or tuberculous meningitis (TBM). Decisions about the timing of ART when patients have both HIV & TB should be made mainly on the basis of the CD4 count. These decisions though can be quite complex and a number of different factors may need to be considered. There are important drug interactions and side effects when ART is co-administered with TB therapy. When ART is started patients should be warned that TB symptoms may temporarily worsen and new features may occur in the first three months. Antiretroviral therapy should be regarded as urgent, with the aim being to start therapy within two weeks following the start of TB treatment. It is advised that ART should be started after it is clear that the patients TB symptoms are improving and that TB therapy is tolerated. The exception to this is in the case of CM or TBM. Antiretroviral therapy can be delayed until 8 weeks after starting TB treatment, but no later. However, if the patient has other WHO stage 4 conditions, ART should also be initiated two weeks after TB treatment is started. The exception to this is in the case of CM or TBM. The longer delay becfore starting ART in this group is aimed at reducing the risk of shared toxicity (as the patient will then be reciving fewer TB drugs) and to reduce the risk of immune reconstitution inflammatory syndrome (IRIS). or TDF + emtricitabine (FTC) (or 3TC) + rilpivirine (RPV) provided VL < 100 000 copies/mL. Rilpivirine cannot be used with rifampicin, and dolutegravir requires dose adjustment with rifampicin. There is significant extra information in the guidelines about the use of different drugs and also patient readiness for ART therapy. at six months and then every six months. If the VL is > 50 copies/mL then the patient should receive counselling, and interventions should be implemented to improve adherence. A repeat measurement of VL should then be done in 2-3 months. A VL > 50 copies/mL while receiving ART should be an indication for urgent action to improve adherence. A subsequent ART change must be considered if the patient meets the criteria for a switch to a second-line ART regimen at the subsequent 2-3 month follow up VL measurement. CD4 counts should be performed every six months. In patients being monitored with VL measurements, if the CD4+ count at baseline was > 200 cells/µL or it increases above this threshold on ART, routine CD4+ testing can be stopped once the VL is suppressed and providing it remains suppressed, as it adds little to management. However, if virological or clinical failure occurs, then a CD4 count should be repeated, as cotrimoxazole (CTX) prophylaxis should be started if the count falls to < 200 cells/µL while receiving ART. The aim of ART in pregnancy is both to prevent clinical complications of HIV in the mother and to decrease transmission to the child during pregnancy, delivery and breastfeeding. There are separate guidelines about the use of ART in pregnancy.